Lingu Swamy has been my friend since three years. He is instrumental in me getting Telugu rights of Anjaan. He has taken 40% stake in Telugu version. This film is made at a budget of 70 crores. It’s a viable project if we take the market in three south Indian states together. A film of this stature has the capacity to collect 150 crores. It’s a solo film releasing in this holiday season. The expectations are huge. The entire film is shot in Mumbai for 120 working days. This film has the backdrop of Mumbai. All the stars who worked for this film are in success streak. High profile technicians like Santosh Sivan, Yuvan Shankar Raja and Rajeevan have worked for Sikindar. What's the story of the movie? It’s the story of a Mumbai underworld kingpin. Somebody double-crosses him and the story is about how he identifies the villain and take a revenge. It’s a revenge driven film. I am sure that Sikindar will be a game changer for Suriya like Bhasha and Nayakan for Rajnikant and Kamal Haasan respectively. It was me who suggested the title Sikindar for Telugu version. Anjaan is the title for Tamil version. Anjaan means fearless. Sikindar and Anjaan represent the character traits of hero. There is a strong soul in story and director is capable of injecting a strong emotional depth. Lingu Swamy has delivered continuous blockbusters so far. Awara film was remade in Bengali language and went onto become a huge blockbuster. Lingu Swamy has made three actors into big stars with Run, Pandem Kodi and Awara (Madhavan, Vishal and Karthi). I am very positive that Lingu Swamy will create box office magic again with Anjaan/Sikindar. Tell us about your journey for 10 years as a producer? I didn’t make money in any film except for Potugadu. But I succeeded in putting efforts and enjoyed the entire journey of filmmaking. I came to film industry with an ambition of producing a silver jubilee film. My first film Evadi Gola Vaadidi generated disastrous talk on day one and then it slowly became a big success. It ran for 175 days. I was the first person to celebrate a film function in Shilpa Kala Vedika when I organized silver jubilee function of EGV. My second film Style has generated super hit talk by interval. I wanted to help Uday Kiran and E Sathi Babu and made Viyyalavari Kayyalu. But that film didn’t do well as audiences have migrated to entertainment-oriented films. Then I introduced lots of actors/technicians and made Sneha Geetham. I am happy that this film has given a chance to many people. I achieved intangible success with all my earlier films. Potugadu gave me financial success. I want to continue making films with good commercial bottom line and also want to have the satisfaction of producing good films. I will make films in other languages as well. I am making one of the best love stories at par with Maine Pyar Kiya, Nuvvostanante Nenoddantana and Titanic. This film is a remake of Kannada film Charminar and is titled as ‘Krishnamma Kalipindi Iddarini’ in Telugu. R Chandru who directed the Kannada version is directing Telugu version. Sudheer Babu and Nanditha play main leads. I have a sequel story for EGV ready. I am also planning to do a sequel to Style with women orientation. I will have future collaboration with Linguswamy to leverage on both of the Telugu/Tamil markets. Tell us about your son’s debut as child hero in Race Gurram? Vikram Sahidev is my elder son. He is seen in few shots in my earlier films. But his major entry was in Race Gurram as childhood Allu Arjun. He is a self-motivated boy and we made a portfolio. I was told by a mediator that Surender Reddy was looking for a boy to play that role. They saw the photos and called Vikram for the audition. He got selected. I never went to the sets and didn’t see previews. I watched the morning show on the release day and was impressed with his work. He was studying in Delhi at that time and he used to fly down to Hyderabad whenever there was a shoot. After Race Gurram, he is flooded with the offers. He is playing the role of childhood Gona Gannareddy (played by Allu Arjun) in Rudrama Devi film. 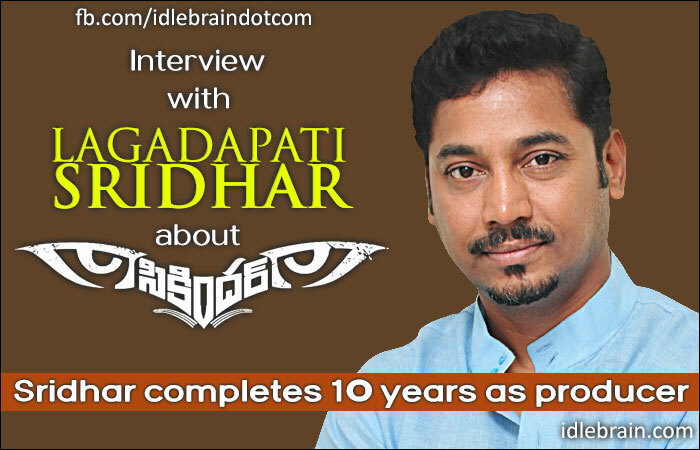 He is also playing the childhood hero characters in Krishnamma Kalipindi Iddarini and Pataas. Vikram is focussed, dedicated and disciplined. He will go places. I want to make Bollywood films that are worth sending to Academy Awards and Cannes film festival. Winning Oscar at Academy Awards and winning Palme d’Or at Cannes is my ultimate dream.